This Board Breakdown brings the Reviver up to the plate. The Reviver, like the Turbo Ripper, has consistently been a top 3 seller, and the last 2 summers was the stand out #1 seller. The Reviver in one word? Agile. Agility is essentially the whole purpose of the Reviver. A generalization for surfboards is the longer the board the easier it is to catch waves (especially smaller, weaker waves) and the shorter the board the easier it is to maneuver. The Reviver is designed to combine the best of both worlds: incredible ease of paddling and wave catching in small, weak and/or slopey waves with extremely agility. The Reviver was designed to be surfed pretty much as short as possible for a surfboard without sacrificing performance surfing maneuverability. And that’s an important point – the Reviver is designed around performance surfing!…in less than stellar waves, of course. It’s a tricky feat to accomplish, but after a number of variations and evolution, the Reviver nails it. The basics are apparent: it’s short (super maneuverable), ultra low rockered and a wide outline (incredible paddle power and wave catching ability). So what’s so special? Well, when you start to go super short and wide (specifically shortening the rail line so much), the boards tend to get squirrelly and a bit out of control. Combine that with the ultra low rocker, and the effect tends to get even worse. And surfing a squirrelly, out of control surfboard is usually only fun for a few minutes. So it took some carefully calculated manipulation to exploit the pro list of the aforementioned characteristics while minimizing and/or eliminating the con list. The first reason the Reviver taps into the pro list are the outline curves. Appears to be simple, but it’s more complex than it seems. Many of my board models, and probably most surfboards around the world, have fairly or very continuous curvatures to their outlines (excluding wings, bumps, etc, which is kind of a different category). The Reviver has what I call a staged outline curve. You may have heard rockers referred to as either continuous or staged; while not referred to commonly, I consider those characteristics to apply to outline curves, as well. So the Reviver has what I consider a double recurved staged outline. Sounds more interesting than it actually probably is, haha. From about a foot up from the tail up to about a foot back from the nose, the rail line is has a continuous large radius curve, maintaining a slight continuous curve. This allows for great speed production and rail hold when driving down the line. The outline curve then recurves in at a tighter radius to “recurve” into the nose and tail rapidly. At the nose, it pulls in the nose a bit. Why do that rather than just keep a round nose? 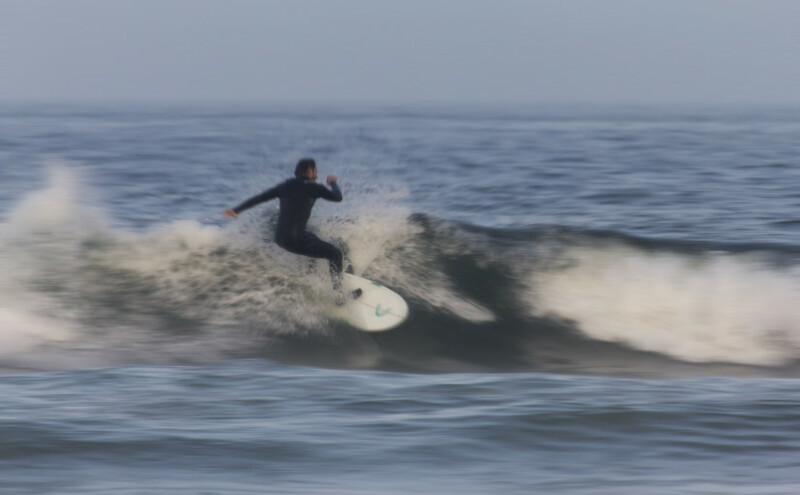 Well, even in the summer when it’s tiny, somehow here in New Jersey and on the east coast the waves are STILL pitchy, so it helps keep the nose a bit more catch free – but the critical nose width is still there to make paddling just as easy as if it had a round nose. At the tail, it carries the straight rail line back a bit farther than if it were a continuous outline curve, creating more drive and rail hold that way. It’s also strategically places to create a subtle extra pivot point for the front fins to work with to keep the turns nice and quick. The outline really is key for the Reviver. Second, the concaves/bottom contours. On almost any surfboard you’d find in a major surf shop in the Reviver category, you’ll find vee in the bottom contours somewhere – either in the tail or even through the whole board. While vee naturally puts the board off balance along the center and creates easier rail to rail flow and transitions, vee also detracts from speed, liveliness, drive and power. For those reasons, I left vee out of the bottom contours on the Reviver. Instead, a deep double barrel concave runs through nearly the entire board, deepening through the center and out the tail. The rail rocker and center/stringer rocker are almost exactly the same throughout the board, which – in combination with the wide round tail – enables the Reviver to feel both energetic and predictable from rail to rail. This helps channel the water more effectively to the fins on the rail since it’s such a wide shortboard, allowing you to have more control especially during your turns. In the smallest sizes (4’8 – 5’0 or so), I will sometimes include a touch of spiral vee either in the tail or vee through the whole board depending on the surfer’s weight and ability. For the groms or very lightweight surfers that don’t quite have the weight to muscle the wide board around, the vee enables the lighter surfers to get the board from rail to rail the same way a heavier surfer is able to. Lastly, the hidden bevelled rails! The Reviver has a flat/semi flat deck with a hidden (soft transition) bevelled rail. This accomplishes two things: (1) reduction of rail volume to make sinking your rail easier (which is important because of the wide outline), and (2) lower center of gravity and quicker reaction time of the board compared to a standard domed deck (due to essentially preloading the deck into the balls and heels of your feet for a faster reaction to your movements), keeping agility of the Reviver of the forefront of its design. So for the shortboarder that always wants to be on a performance shortboard, no matter how tiny the waves are, the Reviver is a critical board to have in the quiver. The Reviver is a constant passenger in my car during the summer whenever I’m headed to the beach. If the Reviver can’t paddle into the waves, then the ocean is flat. Check out more at the DaveySKY Surfboards Reviver webpage. P.S. The Reviver is also an awesome high tide board! When the performance/performance hybrid/hybrid shortboard stops working easily because the tide got on it – it’s too deep and the waves are much softer and slopey even if there’s still decent size, the Reviver can probably paddle into those easily, allowing you to get into the waves early and set up for it to wall up and form on the inside during high tides. Another reason it’s a critical quiver board for the avid shortboarder.